Our Abpromise guarantee covers the use of ab37826 in the following tested applications. WB 1/100 - 1/500. Detects a band of approximately 74 kDa (predicted molecular weight: 72 kDa). Plays a role in T-cell proliferation and differentiation. T-cell lines and natural killer cell lines. Defects in ITK are the cause of lymphoproliferative syndrome EBV-associated autosomal type 1 (LPSA1) [MIM:613011]. LPSA1 is a rare immunodeficiency characterized by extreme susceptibility to infection with Epstein-Barr virus (EBV). Inadequate immune response to EBV can have a fatal outcome. Clinical features include splenomegaly, lymphadenopathy, anemia, thrombocytopenia, pancytopenia, recurrent infections. There is an increased risk for lymphoma. Cell membrane. Localizes to cell surface receptors in the plasma membrane after stimulation with respective receptors (TCR, CD28, CD2) in T-cells. ICC/IF image of ab37826 stained HeLa cells. The cells were 100% methanol fixed (5 min) and then incubated in 1%BSA / 10% normal goat serum / 0.3M glycine in 0.1% PBS-Tween for 1h to permeabilise the cells and block non-specific protein-protein interactions. 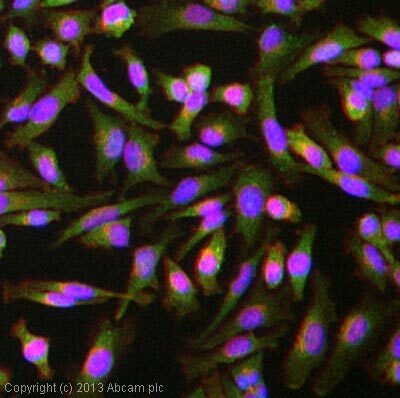 The cells were then incubated with the antibody (ab37826, 5µg/ml) overnight at +4°C. The secondary antibody (green) was ab96899, DyLight® 488 goat anti-rabbit IgG (H+L) used at a 1/250 dilution for 1h. Alexa Fluor® 594 WGA was used to label plasma membranes (red) at a 1/200 dilution for 1h. DAPI was used to stain the cell nuclei (blue) at a concentration of 1.43µM. ab37826 has not yet been referenced specifically in any publications. Publishing research using ab37826? Please let us know so that we can cite the reference in this datasheet. There are currently no Customer reviews or Questions for ab37826.